The pie chart below depicts energy generation by fuel type in the UK in two years. The pie charts illustrate the proportion of electricity generated by five different forms of fuel, (Oil and other, Gas, Coal, Gas, Nuclear, and Renewables), in the United Kingdom in 2014 and 2016. Energy produced by gas and nuclear, which together comprised 52.6% of total energy in 2014, fell marginally to 51.7% in 2016 due to a 0.9% decrease in the use of nuclear power. On the other hand, while there was an approximate 11% increase in the use of renewables over the two years, coal use decreased significantly over the same period from 28.4% to around a fifth (18.1%) in 2016. Oil use remained unchanged in both years at 4%. Category types are given here alongside location, and both years. The question states two years, so the introduction should give which years to be different. The two highlights given are 1) coal and gas maintain their position as the dominant suppliers of energy in the U.K. 2) the rapid decline of coal and huge increase in the use of renewables. Notice the use of active tense in the first sentence, and passive tense in the second. Remember to use the past tense for both years. Gas and nuclear power declined marginally between the years. Begin with a concession to show a significant increase in the use of renewables and an equally important decline in coal at the same time. All nouns are described using adjectives. 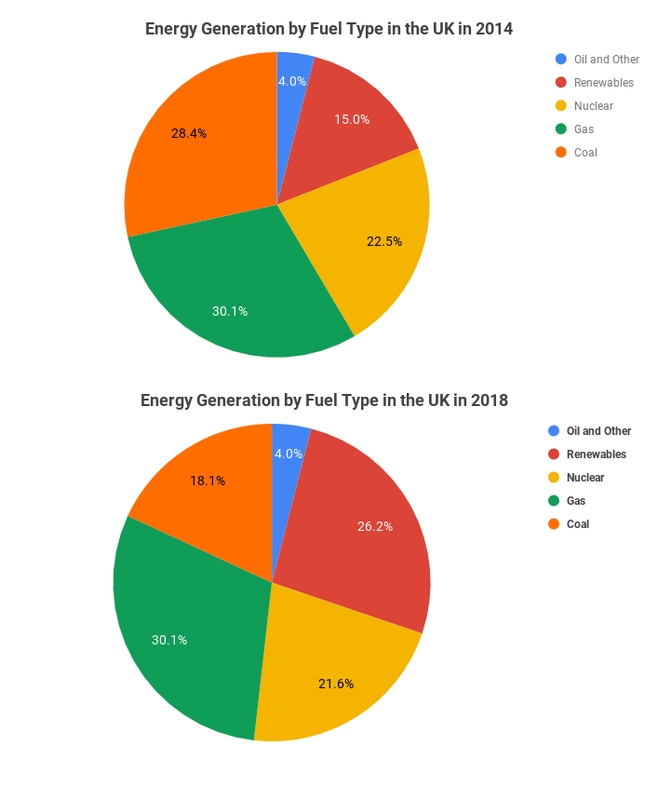 The pie charts illustrate proportion of electricity generated by five different form of fuel, (Oil and other, Gas, Coal, Gas, Nuclear, and Renewables), in United Kingdom in 2014 and 2016. Overall, in both year, gas and nuclear remain important source of energy, together accounting for over half UK’s energy need with little change. In contrast, use of renewables to generation power almost double at the expense of coal which significantly declined. Energy produced gas and nuclear, which together comprise 52.6% of total energy in 2014, fell marginally to 51.7% in 2016 due to 0.9% decrease in the use of nuclear power. On other hand, while there is an approximately 11% increase in the use of renewables over the two year. Coal use decreased significant over the same period from 28.4% to around a fifth (18.1%) in 2016. Oil use remaining unchanged in both years at 4%. Overall, in both years, gas and nuclear remained important sources of energy, together accounting for over half the UK’s energy needs with little change. In contrast, use of renewables to generate power almost doubled at the expense of coal which significantly declined. What are the largest/smallest segments? How can this data be grouped into two paragraphs? What are the trends that relate the two pie charts? What do you notice about the combination of gas and nuclear power in both years? Of the other energy sources, look at renewable and coal usage? How does one seem to affect the other? What sources of power remain unchanged? Gas + nuclear = 52.5 → 51.7 due to 0.9% decrease in nuclear. State all the important information from both pie charts.